I recently found myself testing how browsers sniff for RSS 1.0 feeds that are served with an incorrect MIME type. (Yes, my life is full of delicious irony.) I thought I'd share my findings so far. Firefox's feed sniffing algorithm is located in nsFeedSniffer.cpp. As you can see, starting at line 353, it takes the first 512 bytes of the page, looks for a root tag called rss (for RSS 2.0), atom (for Atom 0.3 and 1.0), or rdf:RDF (for RSS 1.0). The RSS 1.0 marker is really a generic RDF marker, so it then does some additional checks for the two required namespaces of an RSS 1.0 feed, http://www.w3.org/1999/02/22-rdf-syntax-ns# and http://purl.org/rss/1.0/. This check is quite simple; it literally just checks for the presence of both strings, not caring whether they are the value of an xmlns attribute (or indeed any attribute at all). Firefox has an additional feature which tripped up my testing until I understood it. IE and Safari both have a mode where they essentially say "I detected this page as a feed and tried to parse it, but I failed, so now I'm giving up, and here's an error message describing why I gave up." Firefox does not have a mode like this. As far as I can tell, if it decides that a resource is a feed but then fails to parse the resource as a feed, it reparses the resource with feed handling disabled. So an non-well-formed feed served as application/rss+xml will actually trigger a "Do you want to download this file" dialog, because Firefox tried to parse it as a feed, failed, then reparsed it as some-random-media-type-that-I-don't-handle. A non-well-formed feed served as text/html will actually render as HTML, but only after Firefox silently tries (and fails) to parse it as a feed. There's nothing wrong with this approach; in fact, it seems much more end-user-friendly than throwing up an incomprehensible error message. I just mention it because it tripped me up while testing. IE7 detects a RSS 1.0 feed using the content types application/xml or text/xml. ... The document is checked for the strings <rdf:RDF, http://www.w3.org/1999/02/22-rdf-syntax-ns# and http://purl.org/rss/1.0/. IE7 detects that it is a feed if all three strings are found within the first 512 bytes of the document. ... IE7 also supports other generic Content-Types by checking the document for specific Atom and RSS strings. ...then IE will trigger its feed sniffing. Once IE triggers its feed sniffing, it will never change its mind (unlike Firefox). If feed parsing fails, IE will throw up an error message complaining of feed coding errors or an unsupported feed format. The presence or absence of a charset parameter in the Content-Type header made absolutely no difference in any of the cases I tested. 10a. Initialize /RDF flag/ to 0. 10b. Initialize /RSS flag/ to 0. Set /RSS flag/ to 1. Set /RDF flag/ to 1. 10e. Increase pos by 1. 10f. If /RDF flag/ is 1, and /RSS flag/ is 1, then the /sniffed type/ of the resource is "application/rss+xml". Abort these steps. 10g. If pos points beyond the end of the byte stream s, then continue to step 11 of this algorithm. 10h. Jump back to step 10c of this algorithm. You can see the results of my research to date and test the feeds for yourself. Because my research results are plain text with embedded HTML tags, I have added 512 bytes of leading whitespace to the page to foil browsers' plain-text-or-HTML content sniffing. Mmmm -- delicious, delicious irony. Update: Belorussian translation is available. Since I started publishing these weekly summaries over a year ago, I've watched the HTML5 specification grow up. In episode 1, the big news of the week was the birth of an entirely new specification (Web Workers). Slowly, steadily, and sometimes painstakingly, the HTML5 specification has matured to the point where the hottest topic last week was the removal of a little-used element (<dialog>) and the struggle to find a suitable replacement for marking up conversations. This week's changes are mundane, and I expect (and hope!) that future summaries will be even more mundane. That's a good thing; it tells me that, as implementors continue implementing and authors continue authoring, there are no show-stoppers and fewer and fewer "gotchas" to trip them up. Thus, the overarching theme this week -- and I use the term "theme" very loosely -- is "the never-ending struggle to get the details right." HTML5 is full of algorithms. Most of them are small parts of one mega-algorithm, called Parsing HTML Documents. Contrary to popular belief, the HTML parsing algorithm is deterministic: for any sequence of bytes, there is one (and only one) "correct" way to interpret it as HTML. Notice I said "any sequence of bytes," not just "any sequence of bytes that conforms to a specific DTD or schema." This is intentional; HTML5 not only defines what constitutes "valid" HTML markup (for the benefit of conformance checkers), it also defines how to parse "invalid" markup (for the benefit of browsers and other HTML consumers that take existing web content as input). And sweet honey on a stick, there sure is a lot of invalid markup out there. r3923 tweaks the algorithm for parsing the DOCTYPE declaration. This affects DOCTYPE sniffing. r3991 adds to the already-long list of legacy, non-conforming attributes that user agents may encounter in existing web content. As with so many things in the accessibility world, all of this week's changes revolve around the thorny problem of focus. I previously explained why focus is so important in episode 24.
r3887 specifies that each <area> in a client-side image map should be focusable. All of this week's security-related changes revolve around document.domain. As you might expect from its name, this property returns the domain name of the current document. Unfortunately (for security), the property is not read-only; you can also set document.domain to pretty much anything. This can cause all sorts of horrible side effects, since so many things (cookies, local storage, same-origin restrictions on XMLHttpRequest) rely on the domain of the document. This set of changes attempts to reduce the nasty side effects (and the possible attack surface) in case you absolutely must set document.domain to something other than its default calcuated value. r3879 warns against setting document.domain on web applications that are hosted on shared servers. The spec explains the problem: "If an untrusted third party is able to host an HTTP server at the same IP address but on a different port, then the same-origin protection that normally protects two different sites on the same host will fail, as the ports are ignored when comparing origins after the document.domain attribute has been used." r3907 clarifies the workings of the registries for the enumerated values of <link rel>, <meta name>, and <meta http-equiv> attributes. r3904 tweaks the semantics of <link rel="up">. r3987 gives an example to clarify that the <nav> element does not always need to be a child of a <header> element. r3927 gives advice on how browsers could render an <audio> element with a controls attribute. r3992 makes further refinements to the play() and pause() algorithms. Forms continue to be difficult. I like this proposal for adding a document.head property. It would presumably be faster than document.getElementsByTagName('head'), and more reliable than document.documentElement.firstChild. Character encoding on the web is even worse than you think. Google (my employer) released an intriguing project called Google Chrome Frame. It's a plugin for Internet Explorer that enables a number of new HTML5 capabilities on an opt-in basis. Here's a few technical details. Reaction has ranged from impressed to unimpressed to positively ironic. Google Wave is one of the first web applications to opt-in and suggest that Internet Explorer users download the plugin. Steve Faulkner : HTML5 & WAI-ARIA: Happy Families, a slide deck about current HTML5 accessibility features, misfeatures, and support in browsers and assistive technologies. Burst Engine is "an OpenSource vector animation engine for the HTML5 Canvas Element." Tune in next week for another exciting edition of "This Week in HTML5." On August 7, 2009, Adrian Bateman did what no man or woman had ever done before: he gave substantive feedback on the current editor's draft of HTML5 on behalf of Microsoft. His feedback was detailed and well-reasoned, and it spawned much discussion. See also: Adrian's followup on <progress> (and more here); his followup on <canvas>; on <datagrid> (which was actually dropped from HTML5 just minutes after Adrian posted his initial feedback, for unrelated reasons); his discussion with a Mozilla developer about <bb> (which was also subsequently dropped); discussion about <dialog> (which has now been dropped -- more on that in just a minute); Adrian's followup on <keygen>, with additional concerns listed here; his followup on the new input types; and last but not least, his position on <video> and <audio> (and followup about best-choice algorithms). As you might expect, much of the discussion since August 7 has been driven by Microsoft's feedback. After five years of virtual silence, nobody wants to miss the opportunity to engage with a representative of the world's still-dominant browser. I want to focus on two discussions that have led to recent spec changes. The <keygen> element was invented by Netscape and subsequently reverse-engineered by every other browser vendor except Microsoft. It had never been part of any HTML specification before; indeed, it wasn't well-documented anywhere. It was added to HTML5 earlier this year (and covered in episode 12 and episode 31). The spec text borrows heavily from this incredibly detailed documentation posted to the WHATWG mailing list last July. Adrian, on behalf of Microsoft, has stated in no uncertain terms that Microsoft has no intention of ever implementing the <keygen> element, and they would like it to be removed from HTML5. But what does "implementing" <keygen> mean? Well, the point of <keygen> is to provide a cryptography API, but as Ian Hickson points out, the element itself "integrates tightly with the form submission model, it affects the DOM APIs of other elements, it affects the parser, it affects the form control validity model -- it's not a feature that can be sensibly considered 'optional' if our goal is cross-browser interoperability. However, there is an alternative that I think would still satisfy Microsoft's desires to not implement <keygen>'s cryptographic features while still bringing interoperability to the platform in every other respect: we could make the support of each individual signature algorithm optional." r3843 does just that -- it makes the cryptography parts of <keygen> optional. It is important that the element itself be implemented (even without the crypto bits), because it interacts with the DOM and the parsing model in strange ways. As an postscript of sorts, I should point out that a recent change to the keytype attribute (r3868) allows client-side script to detect whether the crypto bits are actually supported. Detecting features is important, and this subtle change will allow authors to write feature detection scripts instead of relying on browser sniffing to decide whether to use keygen-based cryptography. To decide this burning question, the <dialog> element was removed, and conversations are now listed in the section on Common idioms without dedicated elements, with an example of how one might mark up a conversation with more generic markup, if one were inclined to do so. Predictably, this has already caused some backlash from the pro-<dialog> camp. The conversation about marking up conversations also intersects with another burning question: can you use the <cite> element to mark up a person's name? HTML 4 said yes, and even provided an example that used the <cite> element that way. Dan Connolly, who added the <cite> element to HTML 2 (yes, 2), says "I consider that a bug in the HTML 4 spec. I wish I had reviewed it more closely." Still, specs are normative, not what their authors say about them after-the-fact, and the web has collectively had 12 years of HTML 4 which explicitly blessed the technique. I've used <cite> to mark up people's names for years in my own markup, and I'm certainly not going to go back and change all those blog entries to conform to somebody's sense of purity. r3846 clarifies that <button type="reset"> is excluded from form validation. r3841 clarifies that <aside> may be used for sidebars, advertising, or groups of <nav> elements. It can still be used for pull quotes, for example the sentence "Everything you thought you knew about strings is wrong" on a page about string processing. r3837 defines the concept of "being rendered." As with many things in HTML5, what scares me most about this change is that we survived so long without this being defined at all. r3853 adds a note about another willful violation, this time stripping the Byte Order Mark character (U+FEFF) even from places where it is not being used as a byte order mark. Francisco Ryan Tolmasky : On HTML 5 Drag and Drop. WHATWG wiki : Differences between HTML and XHTML is chock full of interesting comparisons. 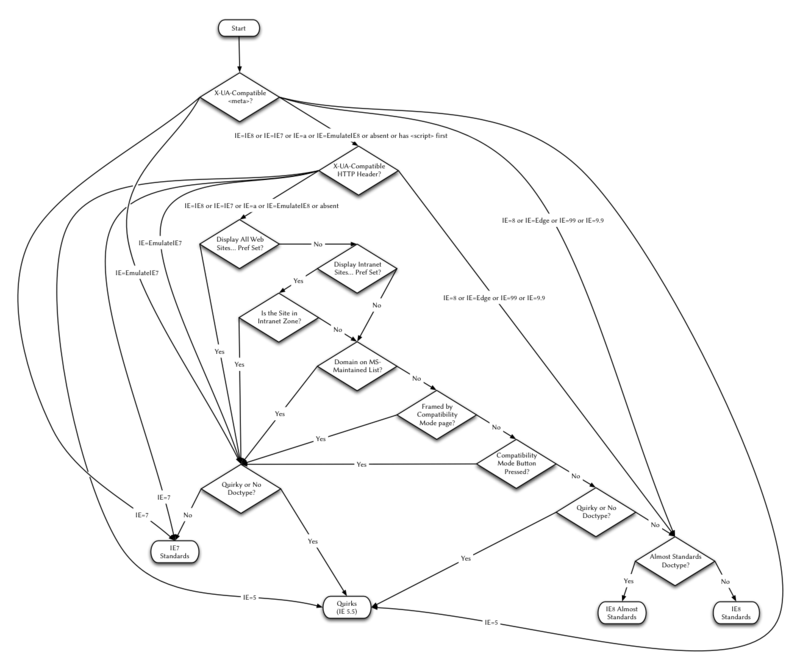 WHATWG wiki : Web Encodings, "an attempt at fixing the Web encoding problem." Good luck with that. Edward O'Connor : Blog templates: a case study in using HTML5’s sectioning elements. "The HTML5 spec introduces several new sectioning elements. ... There's widespread confusion about when to use these elements." No kidding. Aten Design Group : A Brief History of HTML. Jeremy Keith : The devil in the details, on the continuing saga of marking up conversations. Edward O'Connor : HTML5: normativity & authoring guides. "Not only is [HTML5] big, but it's full of complicated algorithms and other browser implementation details that even standards-aware web authors probably don't care about." Indeed. Sam Ruby : First Polyglot Validator Check Deployed. I personally believe this is a waste of time, since there are approximately 3 people in the world who actually serve polyglot documents, all of whom seem to be doing fine without this option, and the presence of the option will just serve to confuse the other 3 million validator users who think they're serving XHTML when they're not. But one of those 3 people has commit access to the HTML5 validator, so I guess we'll get to see whether I'm right or wrong. On a personal note, I'm writing this on a new laptop with a sticky "3" key, a minor annoyance turned major by the fact that this week's revisions are numbered in the 3000 range. While many people complain about the pace of changes in HTML5, as far as I'm concerned, revision 4000 can not come quickly enough. Tune in next week for another exciting edition of "This Week in HTML 5." What’s the right way to spell “HTML5”? The short answer is: “HTML5” (without a space). People in the WHATWG community have commonly referred to HTML5 as “HTML5” for quite a while. However, when the W3C HTML WG voted on adopting “Web Applications 1.0” the question about the title said “HTML 5”. Thus, the W3C HTML WG voted to adopt “HTML 5” as the title, but it wasn’t a vote for or against the space but about “HTML” and “5” in contrast to e.g. “Web Applications 1.0”. Anyway, as a result, the spec was retitled literally “HTML 5”. This lead to inconsistency. Sometimes people kept writing “HTML5” and sometimes “HTML 5” (even on whatwg.org). This kind of inconsistency is bad for branding. The Super Friends pointed this issue out as the first thing they pointed out. Now both the WHATWG Draft Standard and W3C Editor’s Draft spell it “HTML5”. The W3C Technical Architecture Group (TAG) is in the process of reviewing HTML 5. Noah Mendelsohn recently posted his initial, personal, not-speaking-on-behalf-of-TAG notes on HTML 5. Here are my initial, personal, not-speaking-on-behalf-of-WHATWG responses. This may be old news, but I was surprised to see that document.write() is not supported when parsing the XML serialization. This seems to put the nail in the coffin of XML as a serialization format for colloquial HTML. I understand that there are a variety of issues in making a sensible definition of how this would work, but my intuition is that it could be done reasonably cleanly (albeit not with most off-the-shelf XML parsers). Draconian error handling enforced at runtime does not scale to the complexities of modern-day web applications. Ensuring well-formedness becomes increasingly difficult when content is dynamically cobbled together from multiple sources, some of which are beyond your control (user-generated content, third-party ad servers, and so on). It provides no perceivable benefit to users. Draconianly handled content does not do more, does not download faster, and does not render faster than permissively handled content. Indeed, it is almost guaranteed to download slower, because it requires more bytes to express the same meaning -- in the form of end tags, self-closing tags, quoted attributes, and other markup which provides no end-user benefit but serves only to satisfy the artifical constraints of an intentionally restricted syntax. IE never supported it, forcing you down the rabbit hole of polyglot documents. "Authors must not use elements, attributes, and attribute values for purposes other than their appropriate intended semantic purpose. Authors must not use elements, attributes, and attribute values that are not permitted by this specification or other applicable specifications." This is one of the most important sentences in the entire specification, but it's somewhat vague. If "other applicable specifications" means: any specification that anyone claims is applicable to HTML 5 extension, then we can extend the langauge with most any element without breaking conformance; if "applicable specifications" is a smaller (or empty) set, then this may be saying that HTML 5 has limited (or zero) extensibility. The phrase "or other application specifications" is indeed quite important, and quite intentional. It explicitly allows something that previous HTML specifications only implicitly allowed, or disallowed-but-everyone-ignored-that-part: future specifications which extend the vocabulary of previous specifications. Ian Hickson uses RDFa as an example: "If an RDFa specification said that text/html could have arbitrary xmlns:* attributes, then the HTML5 specification would (by virtue of the above-quoted sentence) defer to it and thus it would be allowed. ... Of course, if a community doesn't acknowledge the authority of such a spec, and they _do_ acknowledge the authority of the HTML5 spec, then it would be (for them) as if that spec didn't exist. Similarly, there might be a community that only acknowledges the HTML4 spec and doesn't consider HTML5 to be relevant, in which case for them, HTML5 isn't relevant. This is how specs work." In response to a question about how validators could possible work with such flexible constraints, Ian Hickson writes, "The same way validators work now. The validator implementors decide which specs they think are relevant to their users. The W3C CSS validator, for instance, can be configured to check against CSS2.1 rules or against SVG rules about CSS. It can't be configured to check against CSS2.1 + the :-moz-any-link extension, because the CSS validator implementors have decided that CSS2.1 and SVG are relevant, but not the Mozilla CSS extensions. ... The W3C HTML validator, similarly, supports checking a document against XHTML 1.1, or XHTML + RDFa, or XHTML + SVG, but doesn't support checking it against XHTML + DOCBOOK. So its implementors have decided that RDFa, SVG, and XHTML are relevant, but DOCBOOK is not." People who think that such lack of constraints can only lead to madness go strangely silent when it is pointed out that they have already violated such constraints, and the world failed to end as a result. The HTML 5 draft uses the term URL, not URI. I was under the impression that HTML 5 uses the term "URL" because that's what everyone else in the world uses (outside a few standards wonks who know the difference between URLs, URIs, IRIs, XRIs, LEIRIs, and so on). A few minutes of research supported my impression. Quoth Ian Hickson: "'URL' is what everyone outside the standards world calls them. The few people who understand what on earth IRI, URN, URI, and URL are supposed to mean and how to distinguish them have demonstrated that they are able to understand such complicated terminology and can deal with the reuse of the term 'URL'. Others, who think 'URL' mean exactly what the HTML5 spec defines it as, have not demonstrated an ability to understand these subtleties and are better off with us using the term they're familiar with. The real solution is for the URI and IRI specs to be merged, for the URI spec to change its definitions to match what 'URL' is defined as in HTML5 (e.g. finally defining error handling as part of the core spec), and for everyone to stop using terms other than 'URL'." It should be noted that not everyone agrees with this. For example, Roy Fielding (who obviously understands the subtle differences between URLs and other things) recently stated: "Use of the term URL in a manner that directly contradicts an Internet standard is negligent and childish. HTML5 can rot until that is fixed." Maciej Stachowiak, recently appointed co-chair of the W3C HTML Working Group, recently stated: "We need to get the references in order first, because whether HTML5 references Web Address, or IRIbis, or something else, makes a difference to what we'll think about the naming issue. We need to decide as a Working Group if it's acceptable to use the term URL in a different way than RFC3986 (while making the difference clear). If it's unacceptable, then we need to propose an alternate term." As the old saying goes, "There are only two hard problems in Computer Science: cache invalidation and naming things." I personally don't care about the matter either way, but there is obviously a wide spectrum of opinion. It's unclear whether the factoring to reference WebAddr and/or IRI-bis will be retained. "WebAddr" refers to Web Addresses, a now-defunct proposal to split out the definition of "URL" that HTML 5 uses (which intentionally differs from the "official" definition in order to handle existing web content). The work on the "Web Addresses" specification has now been rolled into IRI-bis; "bis" means "next," so "IRI-bis" means "the next version of the IRI specification." According to Ian Hickson, so important definitions were lost in the process of splitting out "Web Addresses" from HTML 5 and subsequently merging "Web Addresses" into IRI-bis. There is also some feedback about newlines within URLs. Work on IRI-bis is ongoing. As it relates to HTML 5, it is tracked as HTML ISSUE-56. HTML 5 calls for user agents to ignore normative Content-type in certain cases. Personally, I have long been opposed to content sniffing, but if sniffing is going to occur, I would vastly prefer documented algorithms to undocumented ones. The "hope" behind documenting the sniffing rules now is that the web community can "freeze" the rules now and forever, i.e. not add any more complexity to an already complex world. I am personally skeptical, since HTML 5 also introduces (or at least promotes-to-their-own-elements) two new media families, audio and video, for which undocumented or underdocumented sniffing may already occur within proprietary browser plug-ins. And with @font-face support shipping or on the verge of shipping in multiple browsers, there may be new sniffing rules introduced there as well. I hope my concerns are unfounded. Still, having sniffing rules documented in HTML 5 may -- someday soon -- reduce the complexity of a shipping product. And how often does that happen? HTML 5 acknowledges in several places that it is in "willful violation" of other specifications from the W3C and IETF. As stated in §1.5.2 Compliance with other specifications, "This specification interacts with and relies on a wide variety of other specifications. In certain circumstances, unfortunately, the desire to be compatible with legacy content has led to this specification violating the requirements of these other specifications. Whenever this has occurred, the transgressions have been noted as 'willful violations'." §2.5.1 Terminology: "The term "URL" in this specification is used in a manner distinct from the precise technical meaning it is given in RFC 3986. Readers familiar with that RFC will find it easier to read this specification if they pretend the term "URL" as used herein is really called something else altogether. This is a willful violation of RFC 3986." §2.7 Character Encodings: "The requirement to default UTF-16 to LE rather than BE is a willful violation of RFC 2781, motivated by a desire for compatibility with legacy content." §3.4 Interactions with XPath and XSLT: "These requirements are a willful violation of the XPath 1.0 specification, motivated by desire to have implementations be compatible with legacy content while still supporting the changes that this specification introduces to HTML regarding which namespace is used for HTML elements." §3.4 Interactions with XPath and XSLT: "If the transformation program outputs an element in no namespace, the processor must, prior to constructing the corresponding DOM element node, change the namespace of the element to the HTML namespace, ASCII-lowercase the element's local name, and ASCII-lowercase the names of any non-namespaced attributes on the element. This requirement is a willful violation of the XSLT 1.0 specification, required because this specification changes the namespaces and case-sensitivity rules of HTML in a manner that would otherwise be incompatible with DOM-based XSLT transformations. (Processors that serialize the output are unaffected.)" There is a long discussion of these two violations in the comments of bug 7059. §4.10.16.3 Form submission algorithm: "Step 9: If action is the empty string, let action be the document's address. This step is a willful violation of RFC 3986, which would require base URL processing here. This violation is motivated by a desire for compatibility with legacy content." As you can probably guess from these quotes, the HTML 5 community has decided that compatibility with existing web content trumps all other concerns. Other than the use of the term "URL," all of the "willful violations" are instances where other specifications do not adequately describe existing web content. I personally do not understand most of the issues listed here, so I have no opinion on whether the alleged benefit of violating existing standards is worth the alleged cost. In-band global version identifiers, if new implementations handle them reasonably, may be useful for (a) authoring applications that want to track versions used for authoring (b) informative error handling when applications encounter constructs that are apparently 'in error'. The idea of version identifiers has been hashed and rehashed throughout the 5+ year process of defining HTML 5. Most notably, Microsoft proposed a version identifer shortly after the W3C HTML Working Group reformed around HTML 5. Their proposal generated much discussion, but was not ultimately adopted. Several months later, Microsoft shipped Internet Explorer 8 with a "feature" called X-UA-Compatible, which serves as a kind of IE-specific version identifier. I am personally not a fan of this approach, in part because [PNG] it adds a lot of complexity for web developers who want to figure out why the still-dominant browser doesn't render their content according to standards. Versioning in HTML 5 is tracked as HTML ISSUE-4.